I am a big fan of British chef Jamie Oliver, who carved out a niche for himself as the man calling for a “Food Revolution” in the UK and US. Jamie’s goal is to change the way we think about what we eat, as we continue to rely more and more on processed foods or takeout meals. He is especially concerned with how many children today are growing up far less healthy than their parents, with higher obesity rates and early onset diabetes than ever before. His efforts have included shining a light on some of the unplesant truths of school lunch programs across the UK and the US (can you believe the US government classifies french fries as a vegetable? ), but he has also shown that packed lunches from home can be just as bad (if not worse) nutritionally. In the first season of his show “Food Revolution” set in Huntington, WV, he walked around an elementary school cafeteria so the kids could show him their home packed lunches. Only one girl in the room had apples…and she was ignoring them to eat a neon-colored gelatin snack! In another episode a class of six-year olds couldn’t correctly identify common fruits and vegetables. That is just not right! Learning about nutrition and getting comfortable with cooking tasty, healthy, affordable meals using fresh produce, meats, grains, and spices is the first step for all children, adults, and families in leading a much healthier lifestyle. With dessert and cheese in moderation, of course. My biggest problem is that I am in a total rut when it comes to healthy suppers. I am very adventurous in my baking, but my repertoire for meals is woefully lacking. Basically, I make omelettes, lasagna, pizza, tacos, soup, and one version of tofu stir fry. For this reason, I realized that I need to join Jaime’s Revolution, and a good start was to pick up the offical “Food Revolution” cookbook. I love this book for how approachable it is. As he says on the back cover, “What I’ve tried to do in this book is pick a whole load of meals that we all love to eat and break them down to make them as simple as possible.” These meals include pastas, stir fries, curries, salads, soups, meat dishes, veggies, fish, and some good breakfast basics. I was the most excited about the curries. 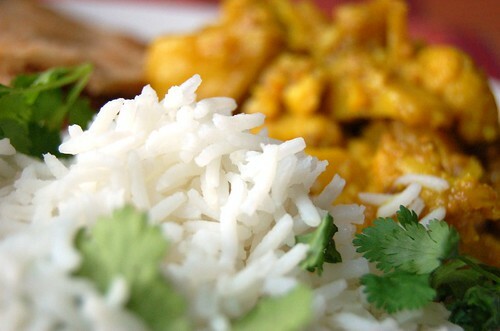 I love curry dishes, but have never felt confident enough to try to make one. I knew Jamie’s version would be basic and easy to follow – perfect to get me started. 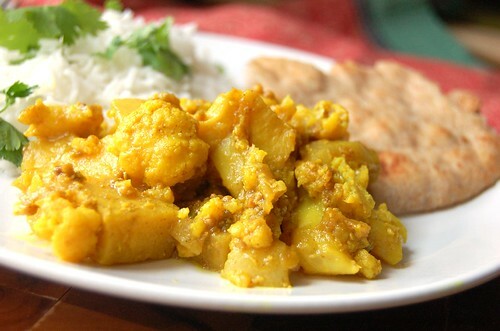 I also knew what I wanted to try first – that heavenly combination of potato and cauliflower that is Aloo Gobhi (which literally means “potato cauliflower”). I have to say when the Aloo Gobhi was done and I sat down to eat my home-cooked version of a dish I have only ever paid someone to make for me, I was pretty proud. Jamie is all about nutrition and removing the fear of “real” cooking, but I have to say I love his Revolution the most for how it’s reminding us that our grandparents never had a microwave dinner or Taco Bell. It’s also an oppotunity for history and tradition – for us to think about the cultural and regional foods and recipes we should have learned at our parent’s or grandparent’s knee. But the great thing is, it’s never too late. The Aloo Gobhi made great leftovers for work the next day, too. In a large, oven-proof skillet on medium-high heat, add a few shakes of oil and the pat of butter. Add the onion, chiles, ginger, cilantro stalks, mustard seeds, tumeric, and cumin and cook for 7-10 minutes until softened and golden. 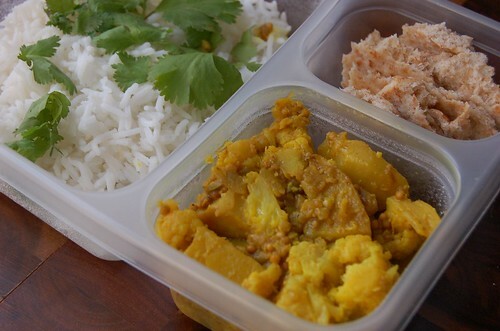 Stir in the cauliflower, potatoes, and coconut. Add salt, pepper, and 1 2/3 cups of water. Bring to a boil, then reduce heat and simmer covered until the veggies are cooked and soft. Give it a stir every now and then, and add more water if you need to. Serve with jasmine rice, add chopped cilantro leaves on top, and squeeze a lemon wedge over the whole thing for added flavor. 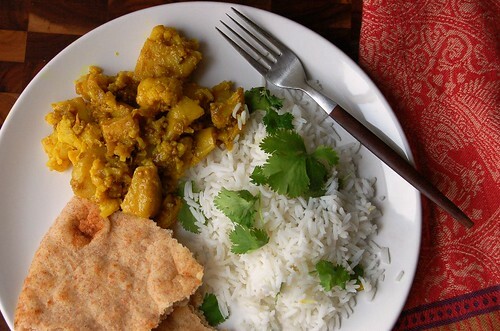 Don’t forget the naan bread! You can often find it with the pita or in the Indian section of your grocery store. Ahhh, we love our Jamie!!! And he had quite a rotten time in the States I think (wasn’t he banned from filming in California schools?). He’s been a great inspiration to people who otherwise wouldn’t cook, especially ‘blokes’ (young macho men) and is constantly pioneering healthy and sustainably sourced food! I’m going to make this recipe tonight and salut you! Looks like you did a fabulous job! I agree that its so sad that kids can’t even identify fruits and vegetables. I’m glad people are finally noticing this is a problem. Aim-this looks SO beautiful! Your pictures are of course fab, but really-this just looks like a wonderful dish you made. Yay for Jamie…now I want tea….